This is one of those ancient arcade games that probably only appeals to folks who were around when it was first released. For everyone else, the premise--create hamburgers while walking over ingredients and avoiding similarly munchable enemies--is unlikely to make much sense and the old-school difficulty of the gameplay is sure to prove more than a bit daunting. 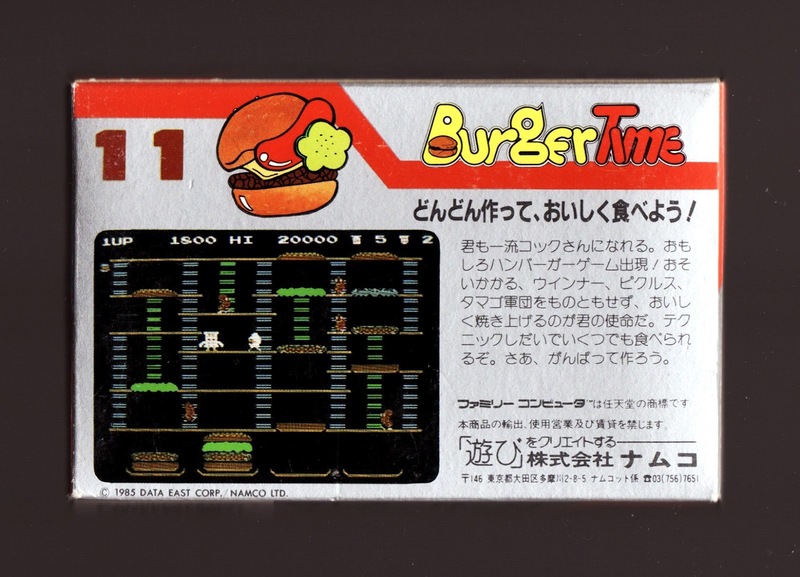 So, where do I sit on this BurgerTime continuum? If you'd asked me back when it was first ported to Nintendo's 8-bit systems, my 9-year-old self would have told you I was located firmly on the "hell no" side of things--in small part because of the game's cruelly challenging nature but in larger part because it's far from "arcade perfect" (something I pointlessly put a lot of stock into in those days). How would my 35-year-old self respond if asked today? I'd say that I'm now on the opposite end of the spectrum and that I'm pretty darn fond of this iteration of Data East's admittedly brutal quarter-muncher. My younger self was right, of course, that the stages in the Famicom/NES version aren't as colorful as those in the coin-op original, nor are the enemies in the former as well crafted as those in the latter, but who cares? Both releases more than get the job done in the looks department, and both feature the same brilliant, can't-get-it-out-of-my-head backing track. Most importantly, though, both also evoke a rather thrilling sense of panic in the player that calls to mind other classic titles--like Mappy and Pac-Man--from the same era. 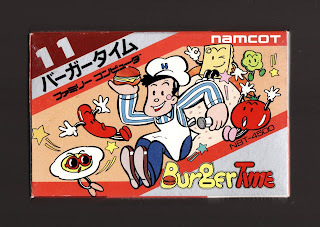 Combine all of the above with the Famicom port's tight-as-can-be controls and completely adorable cover art and you've got yourself a great little pick-up--assuming you don't have a short fuse (see the comments above about this game's difficulty) and you can find it on the cheap. This is one of Robb's favorites. We were so disappointed by the remake of this game that came out a few years ago. Talk about draining the charm out of everything...but the original arcade version in our local arcade still gets our money! Are you talking about that God awful BurgerTime World Tour or whatever it was called, Justin? If so, I agree! It looked awful. Stick with the arcade original or the Famicom/NES version, if you ask me! I love that your local arcade has a BurgerTime cabinet, BTW. How cool is that?